WorldVentures response to Rwanda declaring the company was an illegal pyramid scheme was certainly strange. Rather than prove it wasn’t a pyramid scheme, WorldVentures brushed off the ban by claiming it didn’t do business in Rwanda. This caught the attention of several Brazilian WorldVentures affiliates. Because despite Brazil not appearing on WorldVentures list of authorized countries, business in Brazil is booming. Because of critical legal and tax considerations, WorldVentures must limit the sale of WorldVentures products and services, and the presentation of the WorldVentures business to prospective customers and Representatives located within the United States or one of the countries where World Ventures is currently operating until further notice. Accordingly, Representatives are authorized to sell WorldVentures products and services, and enroll customers and Representatives only in the countries in which WorldVentures is authorized to conduct business, as announced in official Company literature. You may find a list of markets in which WorldVentures currently conducts business, along with any restrictions for each market, in the back office. The US, Austria, Botswana, Canada, Cyprus, Germany, the UK, Greece, Hong Kong, Hungary, Israel, Kenya, Malta, the Netherlands, Russia, Sweden, Singapore, South Africa, Slovenia, Zimbabwe, Puerto Rico, Australia, New Zealand, Iceland, Ireland, Malaysia, Poland, Serbia, Taiwan, Romania, Jamaica, Uganda, Guam, Colombia, Latvia and the Czech Republic. (c) conduct any other activity for the purpose of selling WorldVentures products, establishing a Marketing Organization, or promoting the WorldVentures opportunity. 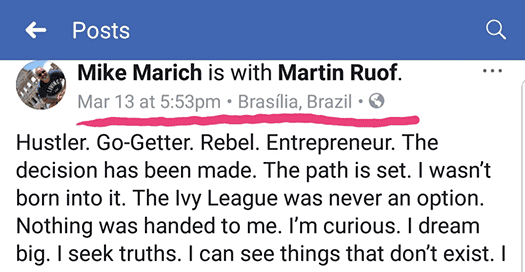 As with Rwanda, WorldVentures appears to be turning a blind eye to clear evidence of business operations taking place in Brazil. IMD stands for “International Marketing Director” and is the top affiliate rank within the company. In January this year Brown took a trip down to Sao Paulo, Brazil. 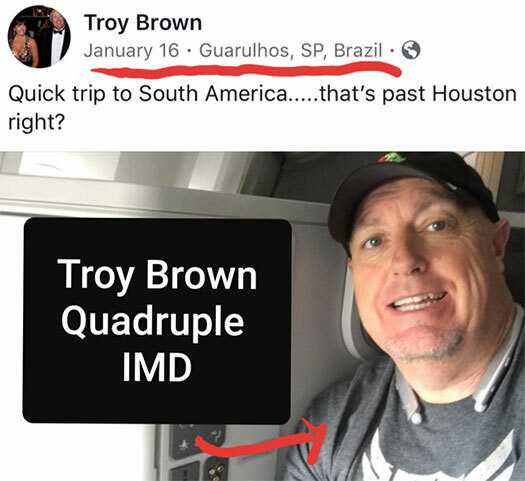 The above looks innocent enough, however other social media posts clearly show Brown was in Brazil holding WorldVentures training events. Training events for who though? 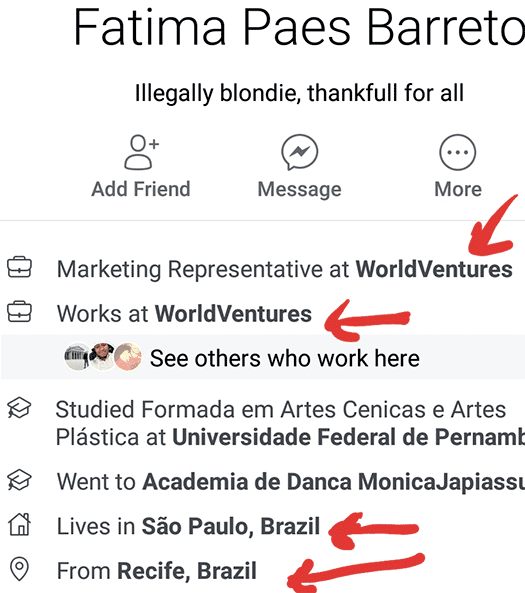 Surely WorldVentures isn’t operating illegally in Brazil as per its own Policies and Procedures? 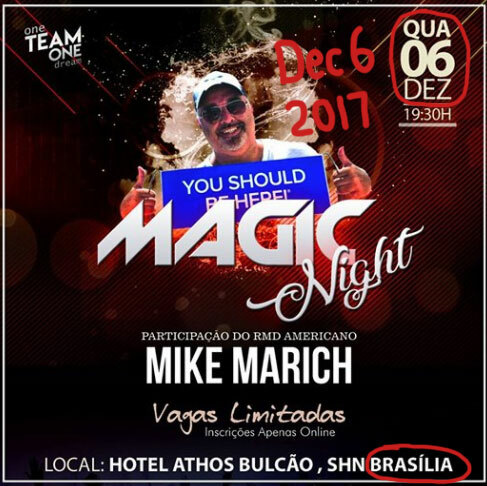 Mike Marich is a US-based Regional Marketing Director in WorldVentures. In March of this year Mike Marich took a trip down to Brasilia, the capital of Brazil. 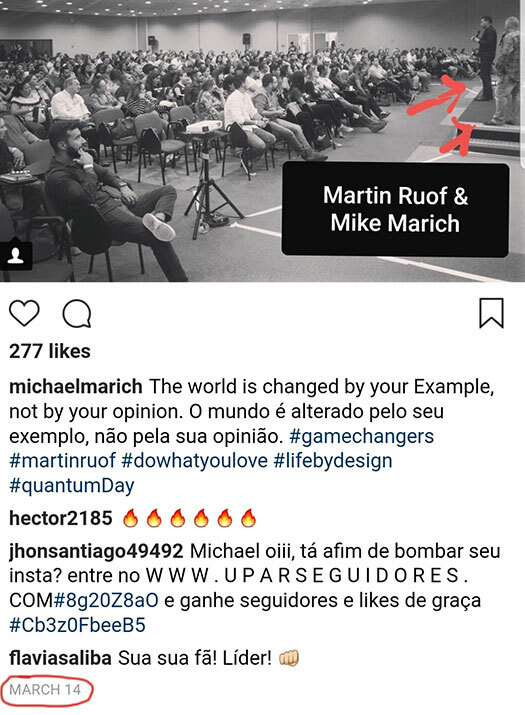 The day after that post, footage of Marich holding a WorldVentures training event in Brazil surfaced. 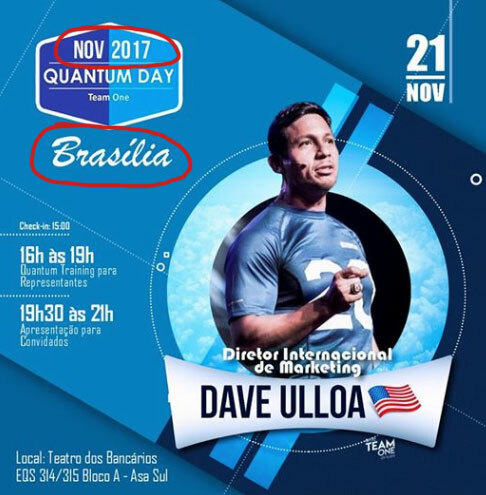 And hell, at this point WorldVentures “unauthorized” Brazilian affiliates aren’t even trying to hide it. Team One – WV is a group of WorldVentures affiliates in Brazil who seemingly operate with full support of the company and its top earners. After outing the above Facebook page I don’t expect it to be live for long, so please let me know if it’s scrubbed and/or deleted. And if you’re wondering if WorldVentures recruitment activity in Brazil might have cooled since March, nope. In May this year Ted Nuyten’s BusinessForHome celebrated Sashin Govender “double IMD” achievement. Sashin is mentored by Matt Morris, Wayne Nugent, Johnny Wimbrey and Jefferson Santos in WorldVentures. As part of his “unstoppable tour”, in July Govender held WorldVentures training events across Brazil. Govender clearly gave no fucks about WorldVentures’ Policies and Procedures, even going so far as to film his time in Brazil. At around 35 seconds into the event, Govender gushes about going on stage in front of around five hundred attendees at an event in Brasilia. According to the description in the video, Govender held events in four Brazilian cities in seven days. And how long has this been going on for? As far as I can tell, recruitment in Brazil appears to have been going on for at least a year – although it only really picked up late last year. 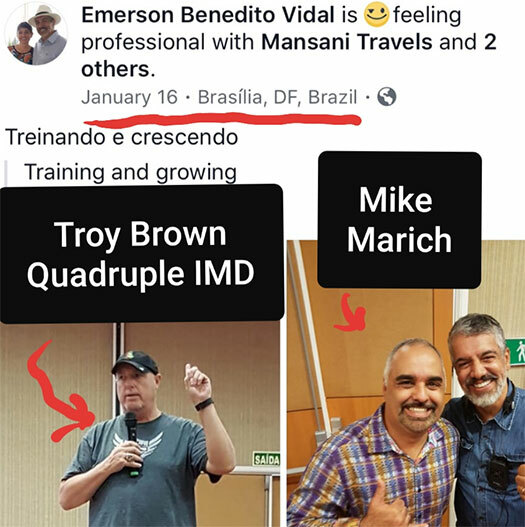 Despite copious amounts of evidence that WorldVentures’ top affiliates are actively marketing and recruiting Brazil, in violation of the company’s Policies and Procedures, nobody in corporate has batted an eyelid. To be sure, if Brazilian authorities crack down on WorldVentures for being a pyramid scheme, corporate will surely put out another “we do not do business in Brazil” response. Bit hard to trot that out again this time though when seemingly every WorldVentures top earner is scrambling to get a piece of the “unauthorized” Brazilian market. We’ve reached out to WorldVentures corporate for a response to their unauthorized business operations in Brazil. We’ll keep you posted if we hear anything back. its only a matter of time until US regulators shut these guys down. Oz you should also check out the Instagram Accounts of Sashin Govendor spruiking in Brazil and WorldVentures Insragram Account. I just found out about this last week. I have a Brazilian (SantistaUSA) and American (LMF Studios) youtube channel, there I have couple of videos talking about Worldventures, and the reason I made those videos and started to research about WV was because of two youtubers (Luis Miranda USA and Minha vida deu Tylty). They are recruiting people from Brazil and since Brazil still not properly set up and it is not yet official I’ve been told by someone that almost signed up with them that they are using US addresses and fake social security numbers for those that are wanting to become a rep.
I’ve tried to contact WV to clarify that and haven’t got a response, I’ve also asked a couple of reps from Brazil and they refuse to answer those questions. I already think WV is bad but those guys taking money from honest people in Brazil just pisses me off. I will definitely make another video this week. What about 2 IMDs in New Caledonia and another in France. Both markets are not open yet these folk have been officially recognised. Having had considerable involvement with WV for 4 years few screenshots but can confirm building in Brazil, (many US leaders) Mexico, ( many US leaders, (Lee Hicks) Thailand, Vanuatu, Tahiti, New Caledonia, Samoa, Cook islands (Lou Harty) and prior to their recent openingin China by partnering with a Vitamin company introduced by Sir Irwin. There is a history of “illegal operation” as a method of forcing a country opening by sending leaders in prior to “plough the ground”. Addresses are provided in legal countries and new members in unopened countries join in the legal country. It’s an unwritten practice. PLEASE KEEP THIS ANONYMOUS AS WE ARE STILL BEING TARGETED (legally) BY WV for walking away, as are many more. Keep searching top ‘leaders’ social media accounts Oz. You’ll see Estonia, France, Philippines, Chile, Indonesia, Spain, Nigeria, Mozambique, Ghana, and several other unopened, unlicensed, and illegal markets generating dare I say the MAJORITY of the entire new revenue of the company! Without this form of quasi- if not all out money laundering, any reasonable should assume there is no way they could stay in business, which they seemingly hardly are in business at all as is! Shame!! Check to see the address’s they are using – ALL Miami address’s from the MLS listing – None of these houses are occupied by anyone in WV. They use homes that are for sale. I personally know this as a FACT. I wonder if using fake addresses is brought up at all these “unauthorized” training events held in Brazil. For what it’s worth I haven’t heard anything back from WV corporate regarding Brazil. They were pretty quick to reach out when they wanted me to know about the David Wood injunction. Reps STILL owed money; vendors still owed money; money being stolen from markets where most are in the dark of the facts; hundreds of millions laundered from dozens of unopened markets around the world – no taxes paid on it to local governments; Hyperwallet should know better; all liability on poor reps, as soon as stories break to media about WV illegally doing business in a country, WV plays the ‘we aren’t doing business there’ card. Unethical and immoral. Attendance of events in opened markets way down; sales in opened markets way down and decreasing. Corporate team spins, spins, spins the facts and fuzzy math to continue to deceive and mislead. Reprehensible. The only reps making decent money – although less than they have made in many years – clinging on with every breath of half truths and put right lies, frantically flying all over the country and world (many to unopened markets like France, Korea, Brazil, Estonia, Spain, Italy! Philippines, Indonesia, , Japan, African markets, and more just to continue their check —-morally reprehensible. How the FTC and Feds don’t raid their offices is beyond me! Oz, I know you don’t like MLM but many including myself still do, but this is one train wreck that must die soon before more people are hurt and turned off from MLM ever again! Please keep on this one and don’t let up until the whole world at least knows the FACTS, then they can decide for themselves. Thanks mate! Oz, I know you don’t like MLM. A common enough red herring circulated throughout the MLM underbelly. For the record, I don’t have anything against MLM. Hey everyone, I just finished making a youtube video (in portuguese sorry) talking about, couple of Youtubers that are signing people up in Brazil, one of them has over 700k subscribers and recently is running for congressman in Brasilia (Brazil). I’ve found the site, he uses to teach people how to sign up and what number to put in under social security space and which addresses to use, so MAJOR criminal act there. Worldventures has also told me yesterday that they are not operating in Brazil and do not have a time line for that yet. Shady business going on in Brazil right now! What about Marc Accetta traveling to Brazil to personally train Brazilian citizens on WV? He is the director of training for the company, executive, & according to public records from a law suit lost by WV, he also owns a percentage of shares in WV. 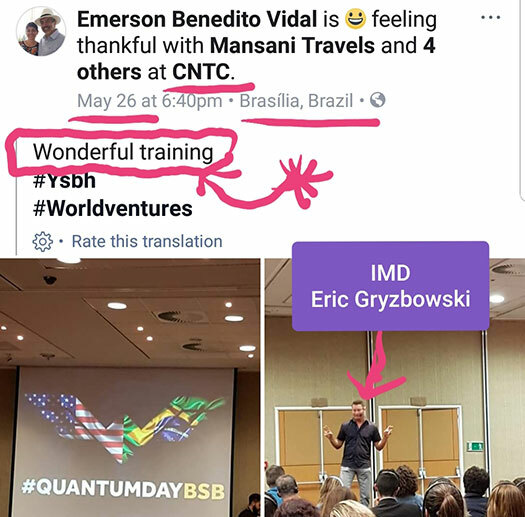 He was in Brazil in April of this year & did a business training at the CNTC. 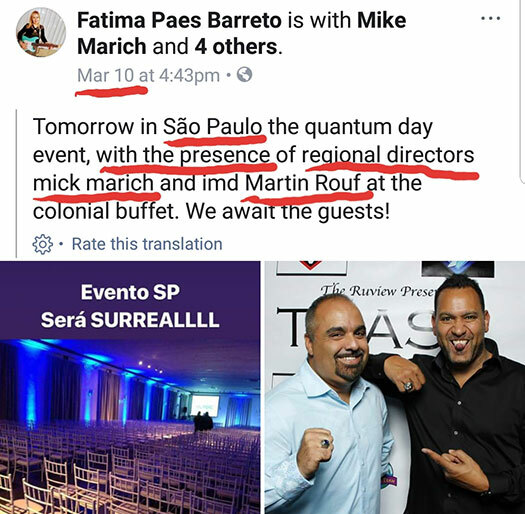 But he also participated in a cocktail party reserved for Brazilians whom have achieved residual income ranks, Senior reps (at least 60customers). According to WV compliance team, Brazil is not open, & as per their policies, no one can promote, present or train on the opportunity or products/services, nor do they give special permission to anyone high ranked reps into a country before anyone else. Im wondering how the revenue coming in from Brazil & every other country WV is not licensed in is being reported to the IRS. They are making money from the sale of the membership & RBS but from the trainings they are doing in Brazil! Don’t let these monsters off the hook! What they are doing is illegal and unethical! How the FTC, SEC, and state Attorney Generals have not raided them and shut them down already is beyond me or any rational person! they are money laundering and preying on people with little resources or access to the TRUTH in places like: Nigeria, Ghana, Mozambique, Philippines, Brazil, France, Canadian provinces, Korea, Japan, Estonia, Italy, Spain, and other countries WHERE THEY ARE NOT LICENSED, PAYING PROPER TAXES, AND SIMPLY MISLEADING PEOPLE INTO BELIEVING THEY WILL EVER LEGALLY OPEN THERE! Come on BehindMLM, these guys are some of the most vile, because they actually seemed to be on the right track and above board at one time, but now they are clinging on to dear life by breaking trust and core values, and they deserve to die a quick death before others get hurt!! Uh, while I don’t disagree with your statements you might be confusing us with regulatory bodies. We can’t shut companies down for breaking the law, we can only report on seemingly unlawful activity. 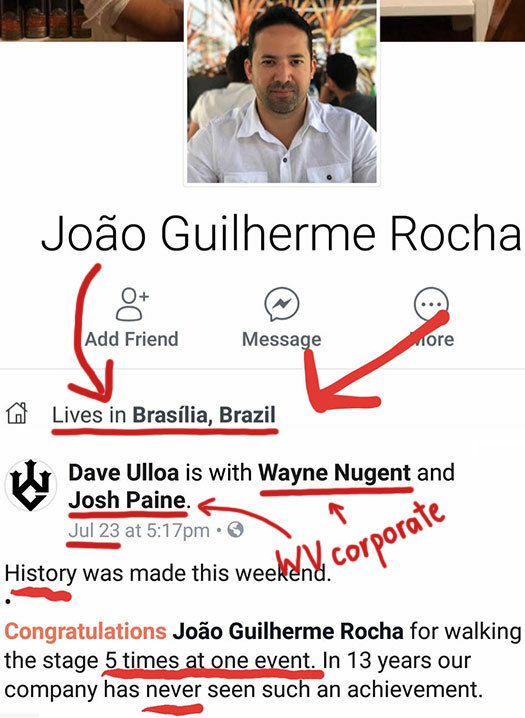 I just posted a video showing the fraud that representatives from worldventures are doing in Brazil, I also put the link of this page in the description so people can come here and get more info. I’ve also reported to a few sites and Worldventures USA. Anyone reading this article and seeing the injustice in what World Ventures is doing, please report it to the Federal Trade Commission! I am NOT an employee of the federal government, just someone that believes we should do the RIGHT thing. I have spoken to the FTC and they say they need to hear from others in order to determine a pattern or concern towards this company. The FTC compiles complaint data that it receives and decides whether to move forward with any type of investigation or appropriate action. If you want CHANGE, then voice your concerns to the correct authorities. This needs to be shared and they need to be exposed !!! It’s very sad what is happening all around the world with this company. Poor countries are getting False hope and information without them legally opening up just to get money in. Not only are they operating against their own policies and procedures, but they completely make up their own ones as they go along. Right now some top reps who have left & resigned from their businesses – their left over downlines are moved to other leaders organisations, injecting their volume to keep them happy and producing. It goes as far as downlines getting their uplines teams which is non-compliant and against their own policies and procedures once again. So fake IMDs ?! And reps walking around knowing this? Unethical, immoral and Greedy!! This dude Mike marish is also promoting world venture to Brazilian community in Japan. Someone I know got in as rep and went on set as speaker, took photo with Mike. They are now operating in the former Soviet Union. Check the ysbh hashtag on Instagram. Majority of posts are in Russian. I am with this company and operate LEGALLY by the rules in Armenia and this is so fi’n wrong!! Scamming Americans using their social. The company needs to shut all the people caught doing this down! I was in WV for two years. I have been to Brazil many times and know the people. WV was operating illegally in Brazil nearly a year before they announced it as an official company. At World Ventures Boot Camp in Miami, Florida they were promoting Brazilians on stage who were from “Miami”. I wish I could post pictures. I just had a guy from Estonia who knows WV is operating illegally in Estonia telling me how he doesnt care and set up a fake address. This is widespread. As a matter of fact it probably is the only thing keeping the company operating after millions of dollars in back pay that is still owed. If you follow the string of articles (below) you will see that WV has been operating illegally in one country after another for MANY YEARS!!! There is no stopping them now. Their pride and ego have gotten in their way!! Too bad the people on stage appear to be God fearing men and women. Wolves in sheep clothing! Hopefully the right authorities will be contacted and will do something soon. Worldventures is operating in Portugal since over 4 years telling the Reps it’s ok to sign in under fake adresses from leaders of Greece. They promise since 3 years that Portugal will open. All trainings are programmed by Marc Accetta Director of training so the Cooperate Team of Worldventures is aware of this frauds but once they get caught they blame their leaders. I doubt that those people are paying tax for their income as they are registered I other countries receiving their commission through online operators on their Visa Cards from paylution and Payoneer Master cards. They are also illegal in Spain, Turkey, Italy and other countries.